Because we have a rooster who does his job, there was a good chance that our broody hens could be sitting on fertile eggs. But hens are not known for their intelligence. Some hens toy with broodiness for a while, only to lose interest. Of our three hens that remained committed to motherhood, there was enough flightiness in their behavior to make me doubt that they’d ever hatch a chick. Broody hens don’t eat or drink much, but they do have to take in some nourishment. The problem is, once they leave their nesting box for a snack, they often get confused about exactly which nesting box they should return to. More than once, I’d walk into the coop to find one of our broodies sitting on an empty nest, with a whole clutch of eggs going cold on the nest just beside her. Add to this our daughters, who were so excited by the prospect of chicks that they began shoving any and all eggs they could find under our broody hens. 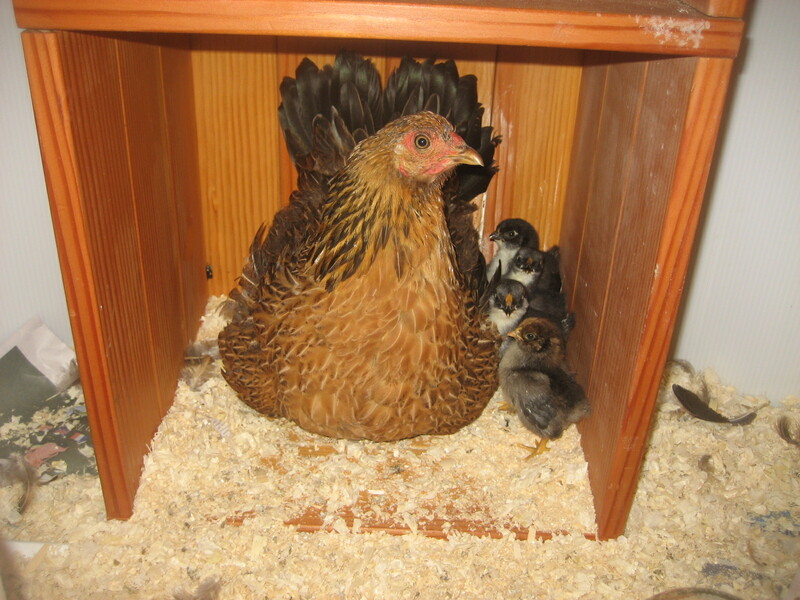 I realized this only after a broody hen got off her nest one day to reveal14 eggs underneath her – more than twice what a bantam hen could be expected to incubate. In the end, we had a big mess: three broody hens playing musical nests with too many eggs started at different dates. I decided to give them until late August, then throw out all the eggs and start fresh in the spring. Matilda was my only hope. On her first day in our care, when we were attempting to keep all the chickens in the coop so they’d know it was their new home, Matilda burst out of a nesting box one of my curious daughters had cracked open to have a peek. She flew to the roof of the coop, then took a spectacular flight and landed about 40 feet up in a poplar tree. I spent the rest of the afternoon chasing her around our property until I cornered her in the shed. That was the last time I bothered to chase Matilda, who continued to fly over the fence every chance she got. If she wanted to be an escape artist, I figured she could live (or not) with the consequences. When Matilda went broody, everything changed. Matilda was the first of our hens to commit to brooding, and she was dedicated. She almost never left her nesting box to eat or drink, and when she did, she proved to be remarkably intelligent for a hen: Rarely, if ever, did she re-settle on the wrong nest. If I got too close, she’d puff up her feathers and growl in maternal protectiveness. If anybody could successfully hatch an egg, it was Matilda. And she did. Almost exactly 21 days after she began setting, I walked into the coop and heard a faint peeping coming from underneath Matilda. I put on gloves to protect my hands from her beak, nudged her aside, and marveled at the little black fuzzball that wriggled out from under her. We settled Matilda, her new chick, and her remaining eggs in a brooder box away from the rest of the flock. Matilda was an excellent mama, so, when I noticed an egg under one of the other broody hens starting to hatch later that evening, I snuck it under Matilda so that she could care for the next chick. The following morning I went out to the brooder expecting to see another newly hatched chick. The crack in the egg was a little bigger, and I could hear a persistent peeping from inside it, but that was all. I talked to my daughters. I explained that this chick might not make it; that nature can be cruel to the weak, but that we shouldn’t intervene and help out a chick that might not be able to survive once hatched. With human babies, we’ve developed enough interventions and technology so that babies who are born weak or sick have improved chances of survival; I had no such technology to offer this chick. I explained this to myself as I explained it to my daughters. I explained it to my practical husband, so that he could keep me from going soft-hearted. Nearly 48 hours after the first cracks appeared in the egg, the chick had created a sizeable hole through which we could see its beak and wiggling brown fuzz. It continued to peep energetically. I held the egg in my hand, and our whole family stared at it helplessly. And right then, I realized that nature might be cruel, but I didn’t have to be. This chick wanted to be alive, and I had the power to give it a fighting chance. So I did. The helped-out chick looked horrible: weak, tiny, unsteady. Since that’s how all my daughters looked at birth, I tried to withhold judgment. But, just to give you an idea of how awful it looked: A short time after its birth, I looked in the brooder box and saw a brown smear against the back wall. When I returned to the brooder, Maddie was out and about. That smear? Matilda’s bowels had regained full function; I’d mistaken Maddie for poop. Maddie is now one week old. She’s been joined by two other chicks, bringing our total to four. Four chicks to replace the two taken by the fox: How’s that for poetic justice? The three chicks that hatched themselves are all black and white, but Maddie, our help-out, looks different. She’s brown, just like Matilda. And so far, she’s doing just fine. She eats, drinks, pokes around, burrows under Matilda’s belly to rest, and hops on her back for fun. As with human babies, all chicks are fragile. And because of her birth, Maddie may have a lower chance of survival than her siblings. But whatever happens, not for a second do I regret helping Maddie out of that egg. In that moment, I realized I had a choice: I could let nature take its course, or I could intervene and give something a chance at life. As it turns out, my opinion is that everything deserves a chance.